One of biggest wildlife seizures, which unfolded during raids in Delhi and Meerut in the last two days, has rekindled the often-discussed issue of wildlife trafficking. At least 117kg of nilgai (blue bull) meat and over 100 illegally imported firearms have been seized by the Directorate of Revenue Intelligence (DRI), which conducted the raid in the house of a retired army colonel Devendra Kumar Bishnoi at Civil Lines in Meerut, Uttar Pradesh. Leopard skin, ivory, horns of swamp deer and sambar deer, antlers of antelopes and blackbucks, deer skulls and 50,000 live cartridges were also seized from the house. Police suspect Devendra's son Prashant Bishnoi, who is a national-level shooter, is involved in arms smuggling and wildlife crimes. Interestingly, Prashant was part of a team deployed by the Bihar government in 2016 to cull 500 nilgai. Uttar Pradesh was recently in news when Mirzapur forest department caught three suspected poachers transporting rare wild cats. In Assam’s Kaziranga National Park, poachers killed 18 rhinos in 2016. In the same year, tiger conservationists raised alarm about poaching incidents as reports of 20 seizures did rounds. In 2015, Down To Earth had reported high rate of wildlife crimes in India based on the report by the Wildlife Protection Society of India (WPSI), which recorded over 20,000 wildlife crime cases in 2014. The State of India’s Environment 2017 report carried an extensive analysis of online media reports on seizures of Indian wildlife made by enforcement agencies between January 2013 and June 2016. In 2005, forest officials and scientists shockingly revealed that Rajasthan’s Sariksa Tiger Reserve, once among the best places to see tigers, had lost its entire big cat population. A similar story played out four years later. This time tigers had disappeared from the Panna Tiger Reserve in Madhya Pradesh. In both these cases, it soon became clear that poaching by organised gangs had played a key role in exterminating the big cat. In subsequent years, seizures of large consignments containing tiger, leopard and otter skins in India, China and along their shared border threw new light on the magnitude and international nature of illegal trade of these Indian species. At the global scale, illegal wildlife trade ranks as the fourth largest illegal industry after narcotics, human trafficking and counterfeit products and is valued at approximately US $19-26 billion per year. According to a recent report by the United Nations Office on Drug and Crime, at least 132,144 seizures of illegal transnational wildlife trade, involving thousands of species, were made across 120 countries in the past decade. Although not a major consumer in the global illegal wildlife market, 20 per cent of all wildlife seizures recorded during 1996-2008 took place in India. Illegal trade in tigers and other large wildlife invariably garners the maximum attention, but these charismatic species are just part of a broad spectrum of targeted species in India. While we sometimes gain small glimpses into this wider trade through news reports, our understanding of the specifics, in terms of what species are traded, how many, where and by what means, is severely limited. In this article, we report a systematic assessment of online media articles containing reports of seizures of Indian wildlife made by enforcement agencies between January 2013 and June 2016, which was carried out by us at Freeland India, a Delhi-based antitrafficking organisation. Media reports were collated into a database using a combination of automated and manual keyword-based online searches, and further processed manually, to glean information on seizure locations, species seized and origin and destination details, if the consignments were seized in transit. 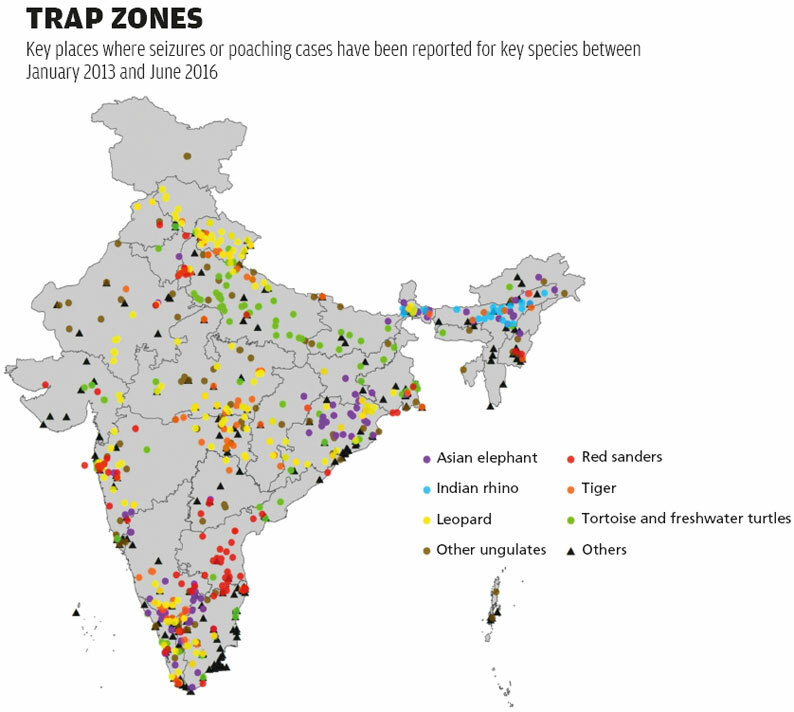 Overall, we recorded 1,291 cases of seizures of illegally harvested and/or traded wildlife and wildlife products (hereafter referred to as cases) involving at least 180 species, including 48 mammals, 33 reptiles, 71 birds and four tree species across India, of which the red sanders was the most common (see ‘Trap zones’). 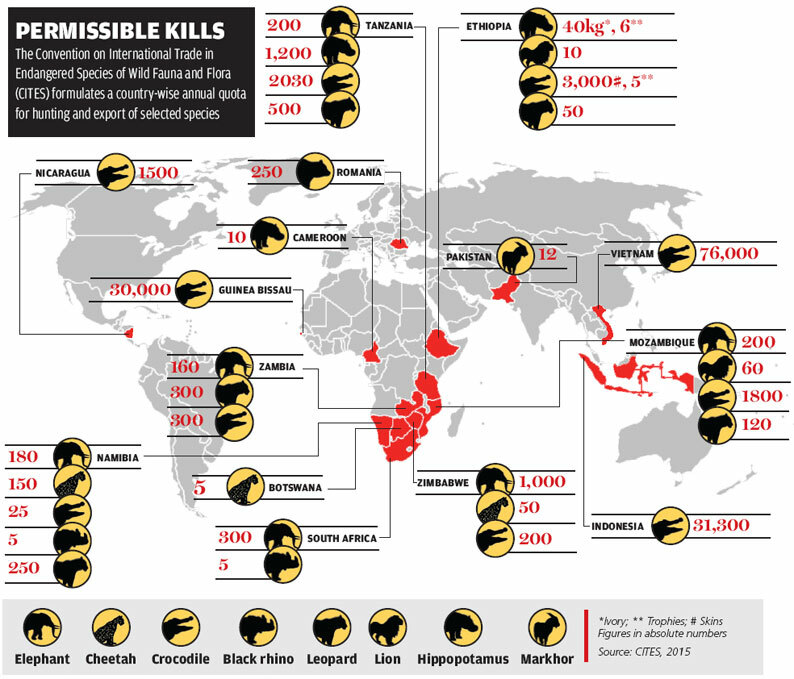 Leopards (182 cases), Asian elephants (138 cases), Indian one-horned rhinoceros (124 cases) and Bengal tigers (113 cases) were the most frequently found species in seizures.Ungulates, including deer, antelopes, wild cattle and pigs, all of which are illegally hunted for meat in different parts of the country, were detected in 160 seizures. Pangolin, a small elusive anteater, was found to be the one of the most traded mammals. Pangolins are in high demand across markets in China and Southeast Asia for meat and scales, which are used as ingredients in preparing traditional East Asian medicines. 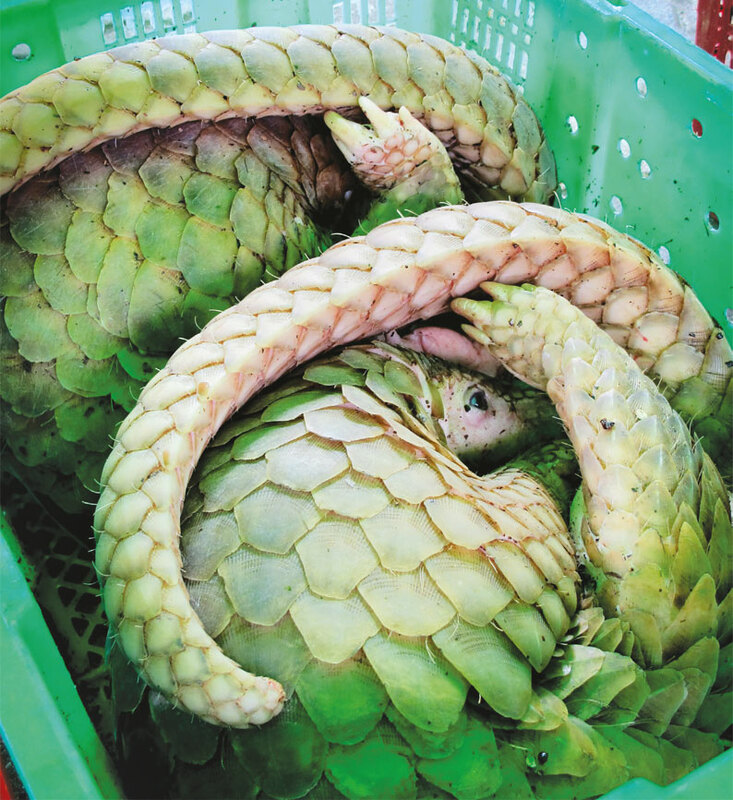 A recent spurt in pangolin scale seizures within Indian borders suggests that our country is increasingly being targeted for supply to international markets. Tortoises and freshwater turtles (tft) were the most commonly seized (10 species in 185 seizures) reptiles. These mainly included the Indian star tortoise and the spotted pond turtle that are in huge demand in pet markets in India and abroad. Soft-shell species such as the Indian flapshell turtle, which are popular for meat in India and are internationally traded for meat and traditional medicines, were also frequently seized. tft seizures regularly involved thousands of individuals and were confiscated in trains, international airports and at various locations along the international borders. International tft trade by air and road was most often destined for Thailand and Bangladesh, which are both known tft trading hubs in the region. Birds were present in 12 per cent of all cases with over 70 species recorded. While a large number of birds were presumably destined for the domestic meat and pet markets, reports of large seizures suggest that Indian birds also face the threat of illegal international trade. Poaching of Indian peacocks for feathers, although illegal, has also continued in India with consignments of these being seized at international airports. Marine species were recorded in over 50 cases. 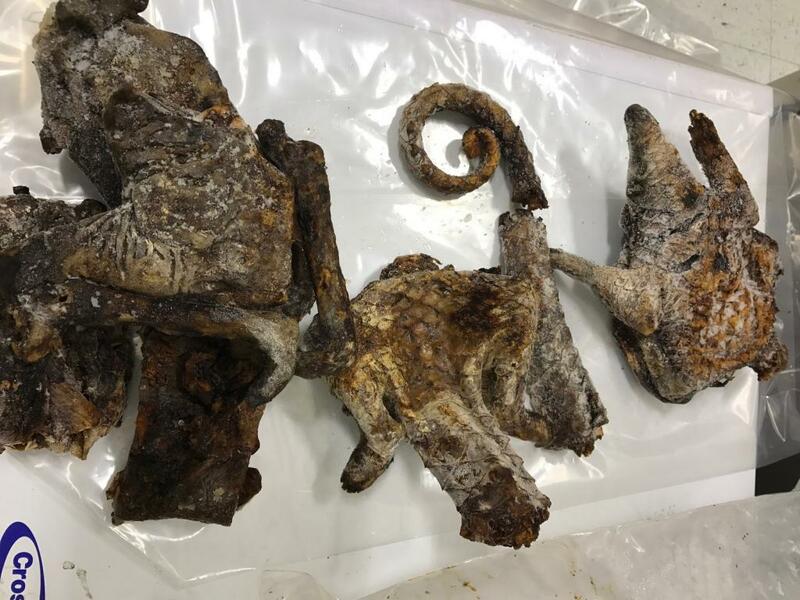 These included seizures of species of sea horses, corals, shells, sharks and a large number of sea cucumber seizures (22 tonnes in 34 cases). Although not popular for local consumption, sea cucumbers are increasingly being targeted to supply a growing international market. These marine invertebrates, which go by the names of “bêche-de-mer” or “tagalong” in culinary circles, are high in demand in Chinese cuisine, and possibly also used, in preparing traditional medicines. Studies in other parts of the world have documented population crashes of some species driven by growing market demands. In India, we currently lack even a basic understanding of the impacts that current off takes are having on sea cucumber species and their populations. Seizure reports clearly point to the large and international nature of illegal wildlife trade in India. They also shed light on the increasingly organised and sophisticated operations of criminal syndicates involved in the trade. During the study period, enforcement agencies seized illegal wildlife consignments destined for at least 13 destinations beyond India’s borders. 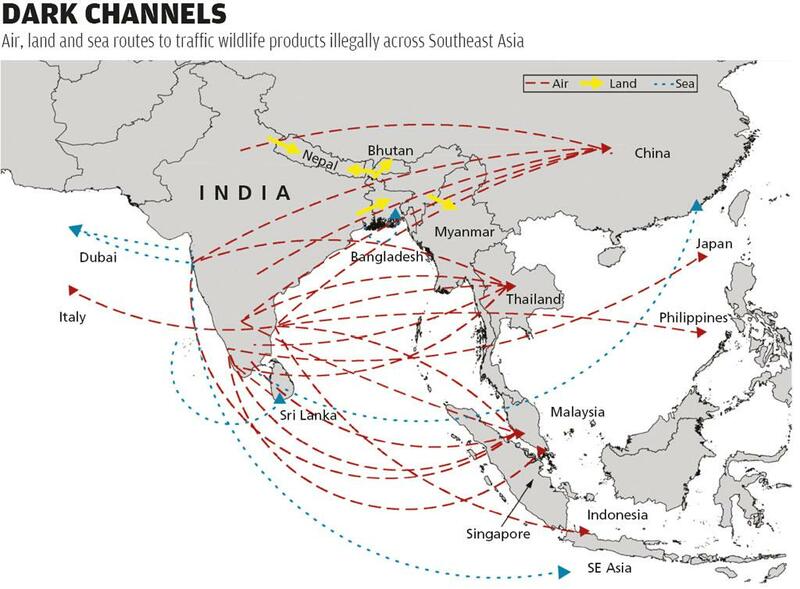 While many seizures were destined for neighbouring countries via land routes, others were made along air and maritime routes to Southeast Asia, West Asia and Europe. Amongst the top destinations for tft were Thailand, Bangladesh and Malaysia. While China was the major destination for red sanders, Sri Lanka was a popular destination for sea cucumbers (see ‘Dark channels’). 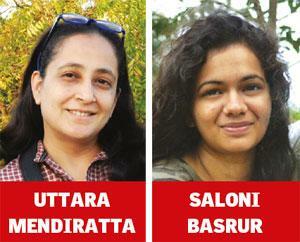 Should India allow trade of wildlife trophies? In 2016 State of India’s Environment Report, the downside of recreational trophy hunting has been discussed at length. The author concluded that flourishing legal trade in trophies may actually end up promoting illegal trade. Africa is a heaven for wildlife. And hunters too. The death of Cecil the lion (pictured above) in Zimbabwe in July 2015 reignited the global debate on the trade of wildlife trophies. Cecil lived in Hwange National Park before he was killed by Walter Palmer, an American dentist who paid US$55,000 for the hunt. A global outcry against the incident and the practice ensued. Many airlines prohibited carrying animal trophies in flights. Conservationists urged the US government to ban the import of hunting trophies. It is notable that the population of African lions has declined across the continent, mostly because of habitat loss and conflict with humans. The continent has less than 30,000 lions— a decline of more than 50 per cent since 1980. Much of this decline is due to poaching, though trophy hunting too has had a significant role. Globally, illegal trade of wildlife is estimated to be worth $19 billion per year, and is rising at an alarming rate. The legal trade too is a humungous $300 billion a year. The US and Europe have about 18 million “big game” hunters (people who indulge in hunting big fauna). According to the Convention on International Trade in Endangered Species of Wild Fauna and Flora (CITES), between 1981 and 2012, three-quarters of all lion trophy exports were sent to only five countries—France, Germany, South Africa, Spain and the US. In the past five years, 21 million wildlife specimens legally entered the US along with an additional 13 million kilogramme of specimens such as caviar. In the past five years, the US government approved import of nearly 60,000 trophies of species that face the risk of extinction. Recreational trophy hunting drives a multi-million dollar industry. The money is used for conservation and to provide livelihood to local communities. Hunting advocates insist that trophy hunting can create incentives for conservation. However, given the widespread illegal hunting across the globe, the activity has received criticism. Changes in reproductive pattern of species, reduction in genetic diversity and adverse impact on ecosystem are some of the negative aspects associated with hunting. In fact, many countries such as Kenya, Botswana and Zambia have already banned trophy hunting. The industry is expanding in southern Africa and Tanzania but is static or declining in Central and West Africa. According to Transparency International, money from hunting fuels corruption in countries such as Zimbabwe, Zambia and Tanzania, which allow hunting in dangerously high numbers. CITES recommends that trade in hunting trophies be allowed only with permits and all the concerned parties must ensure that the practice is not detrimental to the survival of species. CITES also publishes hunting quotas for some selected species. CITES, Food and Agriculture Organization (FAO) and World Trade Organization (WTO) say that hunting, if done scientifically and sustainably, can actually support conservation. The success of initiatives such as Markhor (Capra falconeri) hunting in Pakistan and Tajikistan supports this argument. Hunting has a legacy in India and we have a richly documented hunting tradition. But this legacy has come at a very heavy price. The activity has caused large-scale destruction of wildlife resources, including extinction of many species. Post-Independence, hunting was banned by the government under the Wildlife (Protection) Act, 1972, except for specified purposes such as for self-defence, to prevent crop damage, to counter vermin species and for scientific or educational reasons. Hunting for sport is prohibited in India. However, international trade in exotic species has been allowed as per the provisions of Foreign trade (Development and Regulation) Act, 1992, and the EXIM (export-import) policy of India. One might wonder what’s wrong with Indians going abroad, hunting exotic animals and bringing trophies? The answer to this question is intriguing. 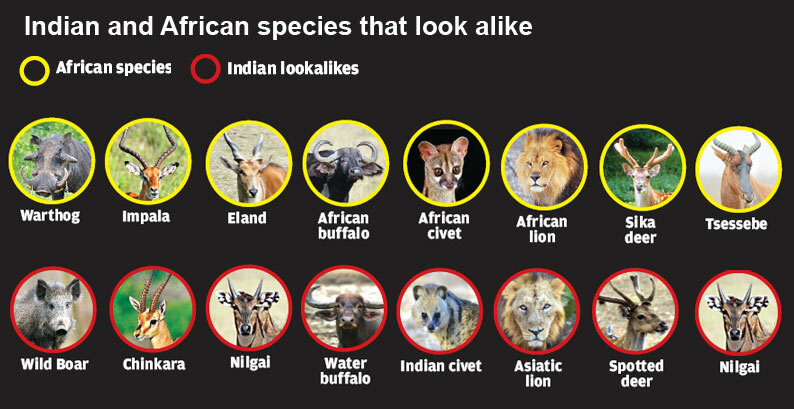 While it provides a few benefits to African countries, it also opens up a channel for illegal trade in Indian wildlife, especially in cases wherein lookalike Indian species are exported under the garb of African species (see ‘Indian and African species that look alike’). Being ecological brothers separated in the Triassic age (250-200 million years ago) from the Gondwana supercontinent, India and Africa have huge similarities in their fauna and flora. Many species, such as leopards, lions and elephants look similar. These similarities are much more if we look at the body parts of these animals (for instance, the skull or the skin) and not the entire animal. 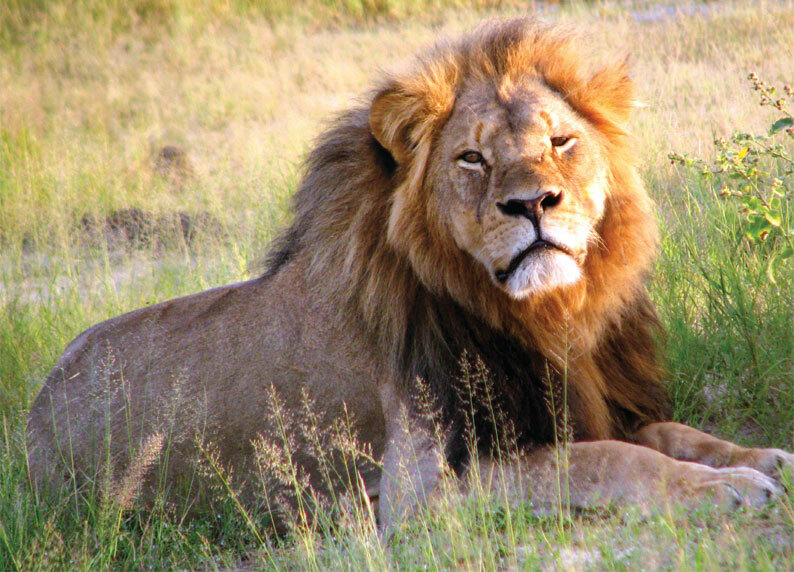 A flourishing legal trade in trophies may actually end up promoting illegal trade. India is already facing huge pressure on its wildlife, with species such as tigers, lions, elephants, rhinoceros, leopards and snakes being in high demand in the international market. In fact, the Ministry of Environment, Forest and Climate Change (MoEF&CC) has been receiving applications from the public for granting permits to import trophies from the African countries such as South Africa, Cameroon, Namibia and Zimbabwe. MoEF&CC sources say that before 2010, the ministry was receiving only a few applications, but the numbers have increased. Till February 2015, the total number of application received by the ministry for import of animal trophies was about 250. These species are hunted in Africa by Indian hunting enthusiasts and imported into India in the form of full animal mounts, shoulder mounts, skulls, skins, horns, scrotum, feet and hooves. Taking a stand, MoEF&CC took a policy decision on the issue in February 2014 and prohibited import of trophy articles made of species listed in Appendix I of CITES or lookalikes of any species protected under the Wild Life (Protection) Act, 1972. It also restricted the number of import of such articles to 20 per person per year. Given the difficulties in distinguishing species that look alike, implementation of the law remains a challenge. And monitoring authorities are highly understaffed. Imported wildlife trophies are checked at ports by inspectors of Wildlife Crime Control Bureau (WCCB), the designated nodal agency for CITES-related enforcement in India, or are sent to regional offices by customs officials for further examination. If no violations are found, a no objection certificate is issued. But if a violation is detected, further action is taken. The mechanism seems to be good, but with the limited capacity of WCCB and the huge quantum of international trade, the challenge is huge. This is the reason MoEF&CC has been contemplating strengthening WCCB. Trophy hunting may be an important tool in wildlife conservation in some countries, but it is not conservation in itself, particularly in the context of India. Though many hotels, government institutions and private houses continue to display wildlife trophies in the form of mounted animal heads, stuffed animals, horns and ivory tusks, we must try to discourage the practice in consonance with our wildlife conservation ethics. This is necessary for the longterm benefit of Indian and global wildlife resources. Elephant, ostrich, giraffe, springbok, blue wildebeest, mountain reed buck, bush pig, klipspringer, hartebeest, kudu, blesbok, warthog, rhebok, impala, gems bock, eland, cape buffalo, bush buck, black wildebeest, zebra, water buck wild beast, bush buck, gemsbok, water buck, mountain reed buck, genet cat, crocodile, roan antelope, hippopotamus, lord derby eland, western hartebeest, western kob, oryx, steenbok, hartmann mountain zebra, red hartebeest, red flanked duiker, grimms duiker and baboon. The decision of the 10th Conference of Parties (COP-10) on the Convention on International Trade in Endangered Species (CITES) to allow restricted trade in ivory and limited culling of the African elephant in three African nations left the Indian delegation fuming. And confused. Led by a relatively junior official, the Additional Inspector-General of Forests (Wildlife) in the Ministry of Environment and Forests, S C Dey, the delegates had gone to Harare with a clear objective: oppose any proposal to lift the ban on trade in species. But the tremendous mobilisation of opinion by the African states at the venue caught the Indians off-guard. “We were totally unprepared for that kind of pressure,” says Ashok Kumar of the Wildlife Protection Society of India, who was a member of the delegation. By voting against the downlisting, India found itself in an embarrassing political situation as well as isolated, since its stand was at total variance from most other developing countries. Ever since India ratified CITES in 1976, it has been seen as one of the staunchest supporters of the convention. “India hub of wildlife smuggling”: A special investigative report on international wildlife smuggling and India’s place in it. Read this in “State of India's Environment Report 2015”, published by the Centre for Science and Environment and Down To Earth.